The definition of insanity is doing the same thing over and over again and expecting a different result. Many clueless Cleveland media members as well as fans think the Browns should take a quarterback with the No. 2 pick in the upcoming NFL draft. The problem is there isn’t a franchise quarterback available in this years draft and by taking a quarterback at this spot, the Browns will again be reaching, just like they did when they took the undersized frat boy in 2014, Brandon Weeden in 2012, Brady Quinn in 2007, and Tim Couch in 1999. No matter how many years certain media members have covered this team, some just aren’t smart enough to realize this. Just like Tony Grossi from ESPN Cleveland. Here he is spitting his pitiful rhetoric. Here’s one from Cleveland Plain Dealer columnist Terry Pluto. Another clueless observation, but at least he is smart enough to agree with me about Joey Bosa. The Browns decision makers are Harvard educated, but let me tell you this. It doesn’t take a Harvard education to know that there are so many holes on the roster, the smart thing to do would be to trade down and accumulate talent. I know that’s not what Browns fans want to hear, but take your emotion out of the thought process, and you will realize that’s the best route to take. I know that Josh McCown is not the long term solution for the Browns, but did you know that in the games he started & finished, the Browns averaged 25.8 ppg, which would’ve ranked No. 8 in the NFL? That goes to show what a veteran quarterback that understands the game can bring. Oh yeah, the games that the undersized frat boy started & finished, the Browns averaged 16.2 ppg, which would’ve ranked No. 31 in the league. If the Browns do select a quarterback in the draft (hopefully later on), the offense can still be well above average under McCown, who will also double as a phenomenal mentor to the future starter. The main issue with the Browns is their defense, and that is the side of the ball that they should focus on in the draft. They finished No. 29 in the league, allowing 27.0 ppg. Oakland had their highest offensive yard output of the season against them. Both the Cardinals and Broncos had their 3rd most yards gained on the season, while the Titans & Chargers had their 4th best offensive yard output against them. In all, seven of the Browns 16 opponents had top 5 offensive yardage performances against the Browns. Let me say, I’m a HUGE Ohio State Buckeye fan. That said, I also keep it real. If not a quarterback, the other player that mostly comes up at No. 2 for the Browns is Joey Bosa. This would be another reach of a pick. Bosa is a 265 pound defensive end. That’s great for a team that runs a 4-3 defense. The Browns, however, run a 3-4 that utilizes defensive ends that are closer to 300 pounds. Bosa would have to play outside linebacker, a position he never played in college and it would make no sense to use the No. 2 overall pick on a player that the Browns would have to move to a new position. A pick that high needs to contribute right away and Bosa would be learning a new position that he might never even excel at. If the Browns ran a 4-3 defense, I would like them to take him in a heartbeat, but he just doesn’t fit into their scheme. Let me tell you why bad NFL teams/organizations struggle. They reach for players based on need in the draft, instead of choosing the best player available. Good to great teams that are only a piece or two away can get away with reaching, but bad teams that need help at multiple positions/units would be better served at improving their overall roster. 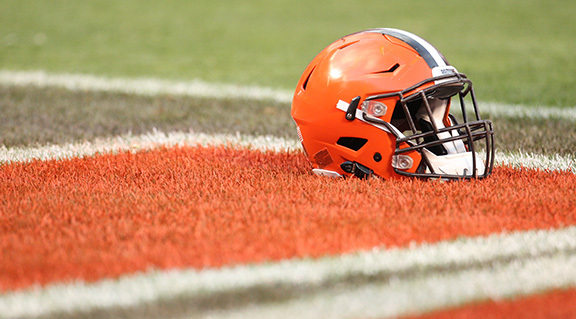 Time and time again, however, teams like the Browns draft based on need, often times reaching for a player that isn’t as good as many still on the board, and time and time again, the results are poor & regimes are turned over once every two to three years. It’s mindboggling that NFL General Managers haven’t figured out this simple concept. So who should the Browns draft if they keep the No. 2 pick? I’d go with either cornerback Jalen Ramsey from Florida State or inside linebacker Myles Jack from UCLA. The Browns missed badly on Justin Gilbert two years ago, and still need a consistent player opposite Joe Haden, and Ramsey maybe the best overall player in the draft. All-Pro linebacker Khalil Mack was available for the Browns in 2014, but they chose instead to trade down and ended up with one of their worst top 10 picks in franchise history. Jack definitely has All-Pro level talent and also plays a position the Browns desperately need a playmaker at. The next big “season” in the NFL off-season is the free agent signing period. While the Browns, like every other team will no doubt add players to their roster, there is no need to spend major money and earn the good graces of many unknowledgeable media members. Teams that end up making huge news during this period, don’t end up making news at the end of the season, unless it’s that they are firing their head coach and/or general manager. Ok, back to quarterbacks. There’s one in this years draft that intrigues me. His name? Kevin Hogan from Stanford. He’s big and surprisingly mobile for his size and extremely smart. Stanford runs a pro-style offense and Hogan could be ready after a year on the bench. He could last until the third round and if he does, I wouldn’t be mad at the Browns for taking him.